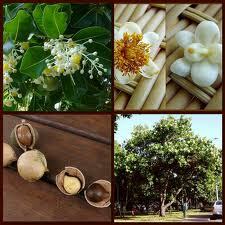 Tamanu oil comes from the tree, Calophylium Inophylium, in the islands of the South Pacific. This tree grows up to 25 or 30 meters tall, with long spreading limbs. It has shiny, dark green leaves. It's sweet fragrant, white, flowers have a yellow center. It bears fruit the size of an apricot with a thin flesh and large nut hull inside. Kernels, inside the fruit, are removed and dried on a rack, for about one month. While drying, they begin turning deep, chocolate, brown. They develop a sticky type of substance, with a fragrance similar to butter pecan. This sticky substance is pressed from the kernels. It has a dark green-amber color, rich thick consistency and a nutty aroma. It's luxurious Tamanu Oil! Tamanu oil is one of the most effective natural acne cures. It reduces pimples, acne, acne scars and blisters. It controls oil secretion, ridding oiliness from skin. It's antibacterial properties prevents skin infections and diseases. It smoothes, softens and firms skin for a clearer complexion. It penetrates the epidermis, dermis and hypodermis layers of the skin, with no greasy residue. It absorbs, fairly, quickly. It regenerates new skin tissue. It has anti-bacterial, anti-inflammatory and anti-neuralgic properties. It soothes dry itchy skin, diminishes red patches and reduces inflammation. It's benefits sunburns, eczema and psoriasis. It's on the cutting edge of skin care products. This natural oil is gaining attention from the commercial and homemade beauty industry. It has antioxidants! It can be directly applied to the skin. Use in roll on applicators. It's stores easily. SKIN CARE: Penetrates layers of skin; epidermis, dermis and hypodermis. Has no greasy residue, absorbs quickly, forms new skin tissue, relieves painful muscles and joints, moisturizes, softens and soothes skin. USEFUL FOR: dry skin, dry itchy skin, eczema, psoriasis, cracked skin, stretch marks, reduction or removal of age spots, odor reduction. RELIEVES SKIN IRRITATIONS: insect bites, stings, athletes foot fungus, infected wounds, burns, acne, acne scars, blisters, cuts, herpes sores, ringworm, rashes, itching, sores, abrasions. RELIEVES PAIN: burns, shingles, rheumatism, sciatica, neuralgia, sprains, sore muscles, pulled muscles and ligaments, swelling or inflammation. -- Massage oil in for 1- 2 minutes. -- Wash face clean. Apply a couple drops of Tamanu oil, avoiding eyes, ears, nose, mouth or any other sensitive areas. Massage, gently, into skin. Your skin will be moisturized and protected from environmental pollutants and harsh weather. Repeat 2 or 3 times a week. Skin will appear more fresh and youthful. Age spots will diminish. If you experience discomfort, with ANY homemade recipe, discontinue use. If you're allergic to any ingredients do not use. If you're allergic to nuts, or pregnant avoid Tamanu oil! Consult your health care provider for advice regarding your specific needs. Tamanu oil is used extensively by women of Polynesia and Fiji. It kills lice and helps get rid of dandruff! Repair damage to the skin of the scalp. Add shine, reduce dullness, add fullness, repair split ends! Moisturize dry, brittle, hair! Protect hair from harsh weather and the sun. HAIR RECIPE: Massage a small amount of Tamanu directly onto scalp and hair. Apply it after washing hair or use as a pre-washing agent. Rinse hair, thoroughly. Towel dry hair or let dry on its own. CAUTION! Heat from blow dryers can damage hair, splitting, weakening and breaking it. Keep blow dryers a good distance from hair. Never blow dry hair for long periods of time. Tamanu oil is used for making homemade soap and other bath/body products. This natural oil is used in commercial and homemade skin care products including: soaps, lotion bars, creams, body butters and lip balms. Some claim it is expensive but others claim the benefits are worth the cost. NaOH: .148 oz. / KOH: .208 oz. Don't heat Tamanu above 135 degrees. High temperatures may cause the partial destruction of enzymes. Don't freeze. Use this natural oil at 5% to lotion bars and lip balms, for added nutritive properties. It has a shelf life of 6 months to 1 year. Store in a cool, dry and dark location, (out of direct sunlight), to extend shelf life. Use Tamanu as early as possible. Make sure to read the manufactured date. Find the right soap making oil, just for you!